Firsd Tea’s jasmine green teas are produced in Zhejiang Province, China. Jasmine green is available in pearl and leaf formats. Jasmine pearls are made from the finest silver tips of tender young buds, gently steamed after plucking and hand-rolled into elegant pearls and then naturally scented with the essence of fresh jasmine blossoms. When steeped, these leaves unfurl and produce a tea with rich floral bouquet and fresh green tea scent, a refreshing sweet taste, and a pleasantly long-lasting floral aftertaste. 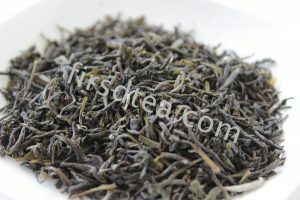 Jasmine straight leaf tea is made from green tea leaves scented with jasmine flowers. Both teas have golden-to- bright-yellow liquor, while the straight leaf has very light astringency. Contains caffeine. Allergen free. Non-GMO. Jasmine teas contain green tea infused with jasmine aroma. Some forms may contain some jasmine petals. Conventional jasmine teas available: Pearls, 9101, 9501, and Yin Hao Tea Bag Cut (TBC). Organic jasmine teas available: Pearls, and Extra Special. Also available in Kosher, Fair Trade, and Rainforest Alliance. Firsd Tea’s jasmine green teas are produced in Fujian and Guangxi provinces. Wiry leaf and leaf portions, depending on the grade chosen. Pearls are rolled into compact balls. Tea bag cut also available. Color ranges from artichoke to olive. Relatively smooth with a bright finish. Jasmine is the dominant aroma, and the cup takes on a silken but lightly astringent character. Look for pale to light yellow colors in the cup with good clarity. Jasmine teas are often drunk alone, but some forms of jasmine green tea may be used in blends. The aromas lend themselves to blending with colored flower petals. Firsd Tea offers a range of jasmine green teas, including Jasmine pearls, Jasmine Extra Special, Jasmine 9101, Jasmine 9501, and Jasmine Yin Hao TBC (tea bag cut). This range of jasmine green teas offers quality grades suitable for single origin specialty teas, tea blends, and iced tea blends.